I mentioned in my initial trade idea that I was planning on setting orders at the 1.4600 handle or the 61.8% Fibonacci retracement level, which was right smack on the falling trend line then. However, price moved sideways for a few days and it appears that the falling resistance lines up with the 50% Fib this time. With that, I’m keeping my original short order at 1.4600 but reducing the position size to half of my 0.5% total risk on this trade and I’m adding another short order at 1.4550 also at 0.25% risk. I still believe that EUR/AUD could keep selling off, especially since China released a couple of economic reports that reflected improvements. As Forex Gump discussed, the HSBC flash manufacturing PMI surpassed expectations and showed a return to industry expansion while the CB leading index marked consecutive monthly gains. This could lend support to the Australian dollar since Australia’s exports would definitely benefit from the rise in Chinese demand and the pickup in risk appetite would support this higher-yielding commodity currency as well. As for the euro, the recent ECB rate cuts are still weighing on the shared currency. Aside from that, German and French manufacturing and services PMIs have shown weak results and hinted of a deeper slowdown in the euro zone. Just yesterday, the German Ifo business climate index also fell short of expectations, as it fell from 110.4 to 109.7 instead of just dipping to 110.3. 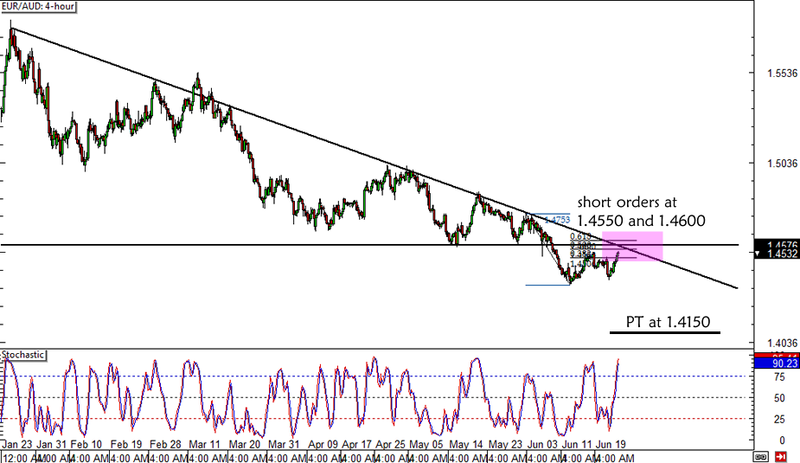 Short EUR/AUD at 1.4550 and 1.4600, risking a total of 0.5% on this trade. Stop loss at 1.4750 and PT at 1.4150. I’ll be trailing my stop once price tests the previous lows at 1.4400. Make sure you read our risk disclosure if you’re thinking of trading this one, too! What do you think of my trade idea?